There are many new and exciting applications of today’s drone technology. The drones on the market encompass a wide range of performance and price points, from backyard toys to sophisticated military aircraft. Consumers can now purchase drones that can perform acrobatics or fly at high speeds and race against other drones. Drone racing is regularly shown on sports networks such as ESPN, and there are professional drone racers. Amazon promises that drones will soon be making deliveries of packages right to your door. The future will in all likelihood produce other uses of drones that we cannot presently imagine. Perhaps the most popular use of drone technology is an airborne platform from which to engage in aerial photography and cinematography. Many films, documentaries, and photographs that you have seen have been created with the assistance of drones. Aerial photography is not a new phenomenon. Human-controlled planes and other aircraft, often used for military or governmental purposes, have long been used to house cameras and obtain photos from the sky. Using these methods for private photographic projects was often a financial impossibility. 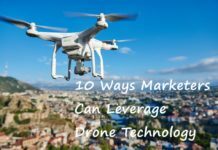 Drone technology and the miniaturization of the camera and electronic equipment has now brought the ability to capture incredible aerial shots within reach of just about anyone. All you need is some money and an interest in learning how to operate a remote-controlled flying drone. There are many options available for those on just about any budget. Amateur and professional filmmakers may first come to mind as customers for this technology, but many other segments of society can also make use of these machines. Researchers in many fields can increase their ability to capture quality data from unique angles and over large areas. Naturalists can film in mosquito-infested jungles with no fear of malaria. Herds of migrating wildlife can be studied from above by a team following them in a jeep. Livestock can be monitored from a central location by a small, stationary squad. These are just a few of the potential applications of camera drones. Local and regional law enforcement capabilities can also be augmented with the deployment of camera drones. Rather than being used for filming they can be employed as eyes in the sky. They then can be used for crowd sizing and assistance in the placement and movement of police resources. 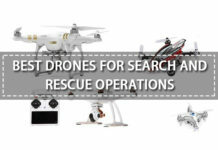 Rescue operations can benefit from this technology, with autonomous drone vehicles searching exponentially larger areas and assisting in the timely discovery of a missing or injured individual. Many units have GPS capabilities which combined with the camera can become an invaluable tool for a search-and-rescue team once the target is visually engaged. Now that you are interested in joining the ranks of aerial photographers let’s take a look at some of the best camera drones available. Though there are drones manufactured that allow you to mount and use your camera, during a flight such as a GoPro, we will be restricting this review to drones that contain a built-in camera. 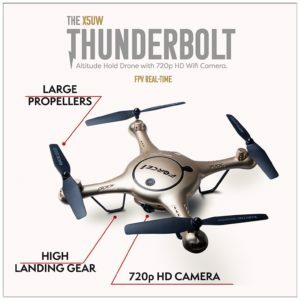 The X5UW Thunderbolt from Force 1 is an inexpensive camera drone that is great for those wanting to experiment with the technology. Though it is reasonably priced at around $130, it does have many features that will increase the enjoyment of your new hobby and allow you to test this new technology. The camera resolution is 720p. While this is serviceable, it is not what a professional photographer would be looking to use. A nice feature is the ability to use First Person View (FPV) mode and see live video on your smartphone. There is the ability to use an SD storage card, but you must provide your card as it is not included in the package. The camera offers a 56-degree horizontal point of view which is excellent for a low-priced drone. The X5UW Thunderbolt comes ready to fly out of the box. But save the box as it will serve you as a carrying case for your drone. 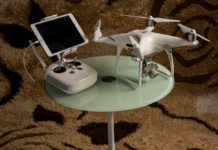 The package includes an extra set of props, the remote controller, a phone holder for FPV, USB charger, and three batteries to allow for extended flight time. This brings us to the time and distance ranges of this drone. 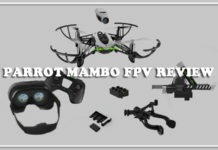 It has a range of 200 feet, with the FPV range limited to 100 feet. Flight time is seven minutes per battery, so you have a total of about 20 minutes air time. Recharging takes about 2 hours per battery. The drone can be controlled by the remote control or through the “Syma Go” app running on your smartphone. Using the phone clip allows you to view use FPV mode on the phone while controlling flight with the remote. It’s a nice way to practice your piloting skills and obstacle avoidance if you plan on eventually racing drones. Features that make this an excellent choice for the novice pilot include automatic takeoff and landing modes, altitude hold, and the ability to create a flight path by using the smartphone app. 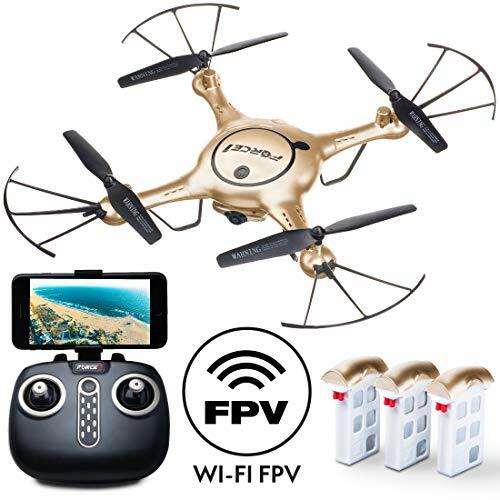 Small and light at around 1.5 pounds and 12.5 inches in length and width, this is a fun drone to learn how to fly and perform some aerial acrobatics. The U818A by Force 1 is an entry-level drone that comes packaged with a camera and VR headset. It comes with a 2.4 GHz controller and can also be controlled with a downloadable app. It is compact and lightweight, measuring 13 x 13.2 inches. This drone will cost you about $150 to own. Users get two batteries which each can power your drone for up to 9 minutes of flying. The batteries take 80 minutes to recharge. A power bank rounds out the power supply and enables wireless charging. The unit’s range is approximately 260 feet from the controller. Though inexpensive, the U818A has some features that will make it fun and easy for the novice drone owner to become an expert pilot. The controller has buttons for one-touch takeoffs and landings. Using the mobile app screen allows you to trace a route for your drone to follow. 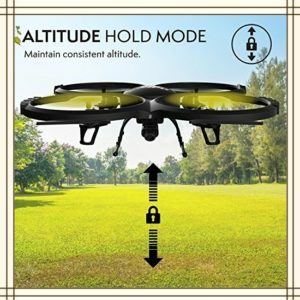 Altitude hold and headless mode to move easier are also part of the package. The camera included with this drone is capable of 2MP resolution still photos and 720p video transmission. The live video feed can be seen on the mobile app screen and through the VR headset. There is even a 4GB SD card for image storage. 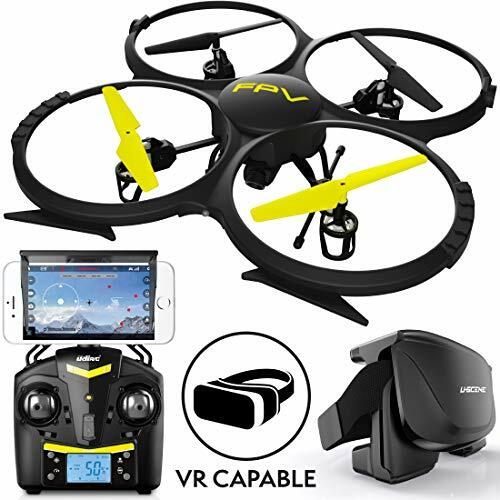 This is a durable drone that will serve those new to the hobby very nicely, and the VR headset lends a nice touch. 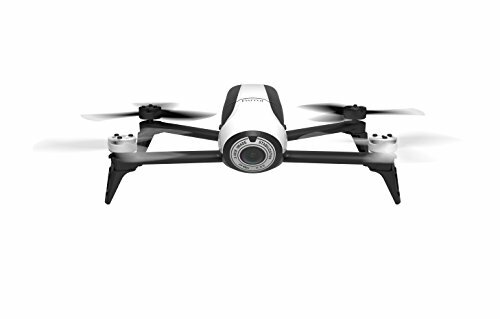 The Parrot AR Drone 2.0 is another low-priced drone that is packed with features that make it more than merely a toy. You can get this drone for around $200, and it features a visually distinctive, sleek, almost flying saucer-like design. This machine weighs about 4 pounds and measures 23 x 23 inches in length and width. It is available in three camouflage color schemes. The Parrot does not come with a remote controller. It is exclusively controlled by an Android or IOS device using the downloaded AR FreeFlight app. This will enable you to command your drone fully, but you can add an optional Nvidia Shield drone controller if you so desire. The package includes one battery that will give you about 12 minutes of flight time with a range of around 150 feet. Battery recharge time is listed as being 90 minutes. An HD 720p camera provides photo and video capability with a wide-angle lens. Video feedback from the pilot’s point of view is seen on your device screen along with the drone control interface. Automatic stabilization helps you retain crisp, quality images. You can record directly on your device through the app, and there is a USB port on the drone to be used for recording storage options. 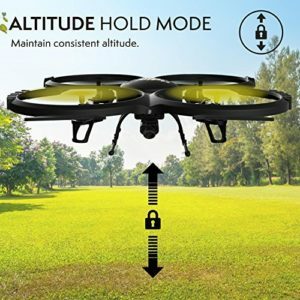 Novice drone operators will benefit from the patented Absolute Control piloting mode, which uses your device position as its reference point. Using your phone you can master flying the Parrot in minutes. A one button flip move is programmed into the controller software for added fun. More information about Parrot AR Drone 2.0. Parrot’s Bebop 2 is a step up in both price and performance. Less than $500 will get you a drone with a high-quality camera system and increased performance capabilities. The Bebop 2 is compact at 15 x 13 inches, weighs little over a pound, and comes in red or white. Its appearance can be deceiving as it is made of plastic and styrofoam, but these design decisions lead to a durable, flexible frame that resists cracking and stands up to multiple rough landings. Battery life for the Bebop 2 is rated at 25 minutes. When battery life becomes critically, low the drone returns and lands on its own. It comes ready to fly out of the box after the initial battery charge. You can operate your drone from up to 1/2 mile away. 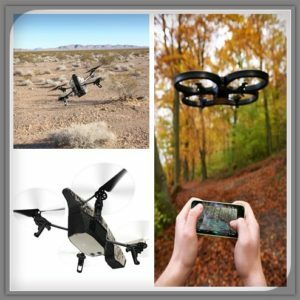 No remote is included with this drone, but it is easy to fly using your IOS or Android device and the FreeFlight 3 app. Takeoffs and landings are done with a single button push and controlling the machine in flight are very intuitive for operators of any level of experience. The app also lets you tailor various performance factors to allow you to tweak your drone and get a little more speed or height. Waypoint flying is also supported by the app and built-in GPS system. The Bebop’s camera system offers a 14 MP fish-eye lens with 1080p image and video capture. The lens allows for better quality photos in low light conditions. Combining this feature with the drone’s powerful rear LED will enable you to keep going later in the day. Its excellent 3-axis digital stabilization system performs well in windy conditions to give you superior, shake-free results. There is even a safety feature that turns off the propellers after a crash to allow for easy retrieval. More information about Parrot Bebop 2. 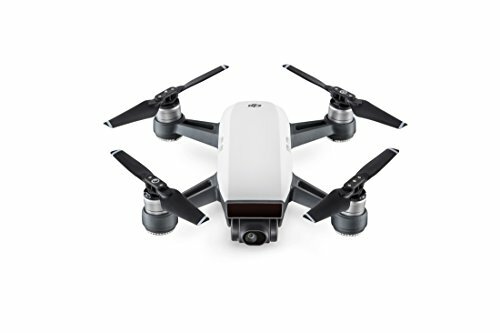 The Spark by DJI is an extremely compact drone that features a high-quality camera system. It offers excellent flight performance and costs around $500. 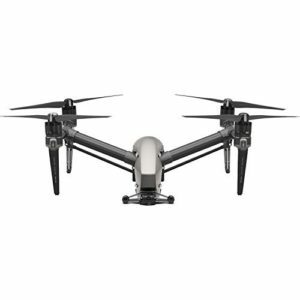 Impressive design considerations has brought forth a drone of minimal proportions that provides some incredible performance. 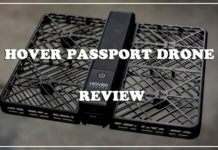 Weighing about 1.5 pounds and measuring only a little more than 9 x 8 inches this is by far the smallest drone our list. It can be controlled by just using a smartphone app, but the addition of the optional controller increases its range from about 150 yards to 1.2 miles enabling extended excursions. The battery will get you 16 minutes of flight time so you can take advantage of that increased range. A full recharge will take around 80 minutes. 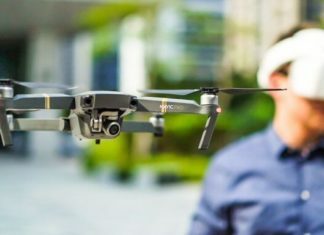 The combination of DJI’s software package and the Spark’s powerful onboard computer offer features such as facial recognition to enable quick launch and lets you use hand gestures to control your drone and camera. Many autonomous modes of flight and camera operation are available to the Spark’s operator, including return to home and flight protection to warn if your drone strays into off-limits areas. When in active track mode, the drone will quickly recognize and track objects. The Spark’s camera system is more powerful than that on any comparably sized drone. You can shoot still pictures at 12 MP resolution. Video transmission is at 720p for FPV mode, but the quality increases to 1080p when the drone is not moving. Excellent stability is provided for this filming platform with a 2-axis gimbal structure. 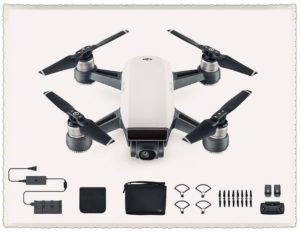 More information about DJI Spark.More details about DJI Spark Mini. The xFold Dragon is beyond the budget of most individual drone customers. I have included it in this review for instructional purposes to show how far camera drone technology can go. 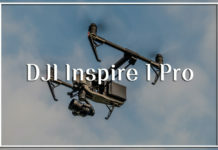 This drone costs over $30,000 and has been used in Hollywood for film production, televised Olympic Sporting Events, and to create documentaries worldwide. It is precisely engineered for use by professional aerial cinematographers. There is an onboard FPV camera that downlinks video at 5.8G speed. With a payload capacity of over 100 pounds, the Dragon is designed to allow the user to mount one or two cameras to film in 2D or 3D. It is made out of strong, lightweight materials that allow the drone to be folded up and transported easily. Multiple axis stabilized gimbals offer unsurpassed aerial footage, and the unit can stay airborne for up to an hour. The frame provides customization based on payload requirements and can use from 4 to 12 propellers. It is compatible with all commercial grade flight controllers. 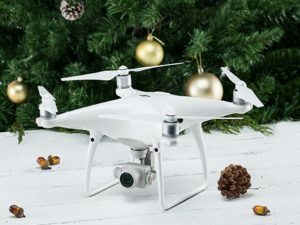 Other functions of this high-end machine include a point of interest mode that will set the drone to circle a specific point with a radius of up to 500 meters to create excellent all-around shots. Auto return home when the controller disconnects and a one-key go home button is software enabled options. The drone also comes equipped with intelligent landing gear to assist in bringing this beast down safely. ♦ If this is what you need and you have the money, there is nothing not to like! 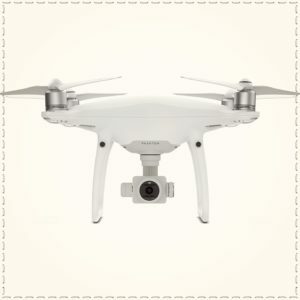 The Phantom 4 Pro builds on its predecessor the Phantom 3 to deliver a drone capable of high-quality aerial photography and cinematography. It is ready to fly and shoot right out of the box and features a camera capable of 4K video and 20 megapixel still photos. It can operate up to 4.3 miles away from the controller, and battery life has been extended to about 28 minutes. 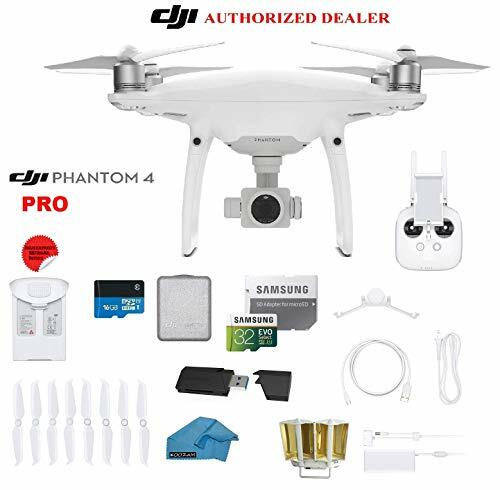 The Phantom 4 is easy to fly and includes an optical sensor unit that allows the drone to automatically detect and avoid obstacles while in flight. Many autonomous camera modes make obtaining professional quality video easy. The Active Track feature lets you tap on any object in the controller’s video display and have your drone follow it. You can also draw your flight plan on the controller’s screen to set up just the shot you want. This feature-rich camera drone will cost you around $1,500 and with options such as a carrying case, and spare battery can get up to $2k. The unit weighs around 3 pounds and can be flown indoors without GPS. 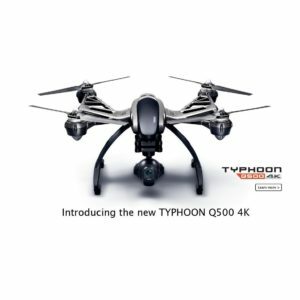 A very highly recommended drone for aerial photography. 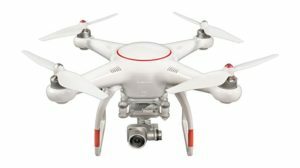 More information about DJI Phantom 4 Pro. 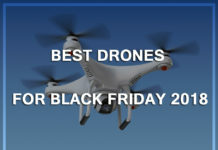 As you can see from the previous reviews, there are many camera drones available on the market today. A drone that contains a working camera of some type can be obtained for under one hundred dollars. On the other hand, you can spend tens of thousands of dollars on a high-end commercial or military-grade surveillance drone. The intended use of your drone, as well as your experience with flying them, will guide you as to the quality and price of the machine you choose to purchase. The various components we will discuss below can all have some degree of influence on your final choice. In some cases, a particular feature, such as ease of use, may ultimately be the deciding factor. 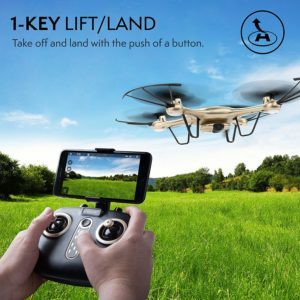 Maybe you want to be able to control your drone from your smartphone or tablet, and not need to engage a separate remote control device. Take the time to analyze your needs and the abilities of your pilot or pilots. The right drone for the family that just wants to take overhead pictures of the backyard pool is not the same one that will best suit a professional photographer. Similarly, a drone with a range of many miles might be overkill for the novice pilot who will be operating their aircraft over a limited landscape as they develop their skills. Drones that will be used daily or regularly will call for different characteristics, such as durability, than those taken for a spin on the occasional weekend. Be realistic about your piloting capabilities and expectations for the machine when deciding on the right drone for you. Here are features to consider when deciding which camera drone best fits your needs. Since we are talking about photographic drones, it is only appropriate to lead off with the distinguishing piece of equipment – the camera. All the drones discussed have their camera units built-in to the drone’s body. This eliminates the ability to replace the camera with a different model if the goals for your photography change. Here is where a good understanding of how you plan on using the one is essential. Maybe you plan on merely using your drone for fun in your yard or the park. If all you want is to get some live video that you will not be saving or sharing, then camera quality might not be a significant concern. You might be able to get by with a low-priced drone with HD 720p video capabilities. This quality will not be suitable for a professional who wants to share their films or photos with others. 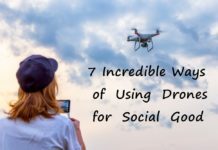 If that is what you are going to be doing with your drone, then you will want to focus on the ones with the best photographic capabilities. For a price, very high-quality video and still photography are possible with camera drones. The range you require for your camera drone is very dependent on its intended use. 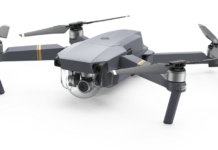 Most users who are only using the machine for fun and amusement can get by with drones that offer less performance on this front. A couple of hundred yards is more than sufficient to have some fun with your aircraft. Newer pilots also may not need a drone with an extensive operational range. 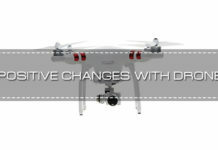 As the drone’s purpose changes, the range required to fulfill its duties may also change. If you want to survey your fields, you need to know the maximum distance from the control point that you want to be able to see. Your drone needs to achieve this range, or there will always be holes in your observational ability. Similar distance considerations need to be factored in for drones intended to assist in rescues or law enforcement activities. Filmmakers who want to film chase scenes uninterruptedly will be interested in the range of their camera drone. 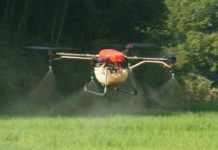 The limited range could adversely affect the ability of the drone to perform its job adequately. There may even be an issue with keeping human controllers a safe distance from the observational target. Many drones are ready to fly right out of the box or only require some minor tasks such as attaching the propellers. Others may demand more extensive assembly before being ready to use. Some drones may need additional equipment to be operational. If this matters to you, check it out before you buy. Based on your or your pilot’s experience, you may be influenced by the user-friendliness of the control system. New pilots will favor an easy to understand interface. This type of control mechanism may not afford the features available to someone more experienced and comfortable with a complicated, and more feature-rich system. Honestly, evaluate your needs in this area as you can always step up to a more versatile drone after you have mastered the elementary piloting skills. The remote control system is one of the most critical components of your camera drone. It is how you, at very least, control the flight of your aircraft. In many cases, the remote control device also either controls the camera or lets you view a live video feed. Some drones are controlled by the use of apps running on your smartphone or tablet device. They require that you have a smartphone as there is no other way to manage your drone. Separate, GPS powered, remote control devices are also used with many drones. Some manufacturers give you the option of controlling your drone using a dedicated remote device or a smartphone. There are pros and cons associated with each type of remote control philosophy. The use of your smartphone eliminates the need to be concerned with another piece of equipment. You won’t need to remember to charge the controller or bring extra batteries. It will, however, run down the power on your phone which could be problematic. Smartphone controllers may have fewer options for flight control as everything will be done on the device’s touchscreen. Conversely, the dedicated remote offers the manufacturer and user choices that an app can not match. A dedicated controller can add joysticks or other manual control elements that cannot be duplicated on a screen. Some controllers offer the combination of a built-in touchscreen or video monitoring capabilities. The drawback is that you will need to keep track of the location and power consumption of another piece of gear. 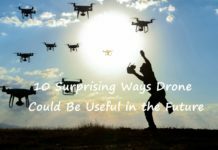 You may be forced to use a particular type of remote because you just love a specific drone for its other features, and are willing to use whichever remote it provides. There are situations where the remote may be a determining feature in helping you choose your drone. Review all of your options and make the sensible choice for you and your needs. Related to the issues of ease of use and the remote control are the navigation options afforded by the drone you choose. Lower-priced models often can only be operated manually, with the pilot making all the decisions regarding flight movement. Manual operation forces the operator’s focus on safely maneuvering the craft and will limit the amount of attention that can be used in directing the camera. 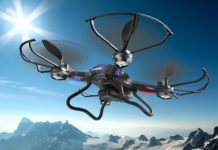 Many drones offer varying degrees of autonomous flight instruction. This can be accomplished by employing flight modes preset in the controller or by the apps that are used to control the drone. Some models also offer you the ability to pre-program your flight path and let the controller do its thing while you can concentrate on getting the photos or video that you want. A favorite feature is a return to home mode which enables the drone to return to home if it loses its remote control signal. Collision avoidance detection is another navigational feature offered on some more advanced drones. 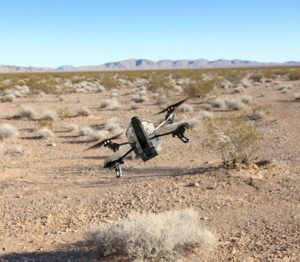 These systems promise to keep your drone safe from mid-air collisions and work in conjunction with an autonomous or preprogrammed flight path. Auto takeoff and landing modes are also available on many drones, These are especially helpful for inexperienced operators but come in handy for all drone pilots. Most drones get their power from rechargeable batteries, though in some cases you may find one that requires the use of disposable alkaline batteries. The more economical choice is to use the rechargeable type as it will lessen the costs over the lifetime of your drone. Some of the remotes may also use disposable batteries, so be sure to check to be sure. While rechargeable batteries will be cost-efficient over time and are also more friendly to the environment, they are not without their potential issues. 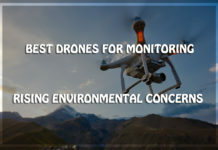 Some of these can be of critical importance based on how your drone is used and need to be considered when making your purchase. Rechargeable batteries have two performance points that are critical to the drone’s operation. First is battery life when in use. This will determine the amount of time your drone can remain airborne. Indeed using additional batteries will allow you to take off again, but you will have to land to replace them. Longer battery life leads to longer time spent in the target area without disruption and will enable you to engage in more productive photographic flights. Perhaps equally significant is the amount of time needed to recharge your batteries fully. 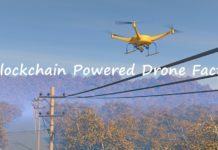 Based on your ability to recharge your batteries, you may be able to continuously swap out a small set, thereby keeping your drone in the air all day except for downtime to enable battery replacement. Very long recharge time will mean that you need more batteries or be content to work in a shorter window of flight time. The cost of purchasing extra rechargeable batteries may force you to be satisfied with the craft’s original capabilities. The stability of your airborne photographic platform can have a significant impact on the quality of your photos and videos. This may or may not be of importance to you. When shooting for fun you can decide to stay grounded on a windy day. If you are looking to shoot professional grade photos and video you may have a schedule to keep and be interested in minimizing your downtime due to weather. As your quality and availability demands increase, so will the quality of the stabilizers that will fulfill your needs. High-end drones allow for very stable operations and may employ an optically-based stability system. Professional photographers and those with serious intentions for their images should strive for the most stable in-flight service they can afford. Even though we are not racing these drones, speed may be a factor when choosing a camera drone. 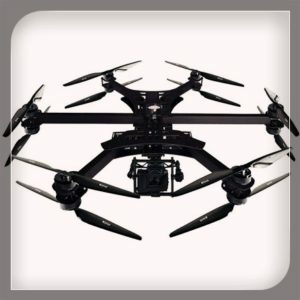 Researchers or filmmakers may want to follow action of a certain speed, and you want your drone to be able to keep up or constantly be filming from behind. The size of your drone can have implications if you are trying to film unobtrusively. In that case, you would probably be drawn to the smallest drone that satisfied your other conditions. Size and weight can also be of concern if you plan to carry your drone for extended periods to reach your filming location. The ability to transport your drone easily can make some models more appealing than others. Your drone’s durability is a critical factor as you do not want to be replacing it regularly. 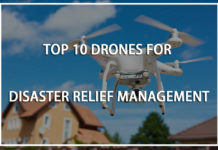 You would like your drone to have the ability to withstand a rough landing or a glancing encounter with a tree without sustaining extensive damage that requires replacement. Lower-priced drones can often be manufactured using plastic parts that may not last well with repeated use or survive many landings. 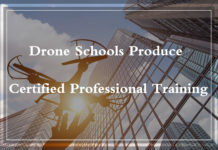 Drones constructed out of aluminum or composite materials offer exceptional durability and will stand up better to the real-world conditions that your done will face. As you can see, the world of aerial photography and videography is now open to anyone with interest in becoming involved. 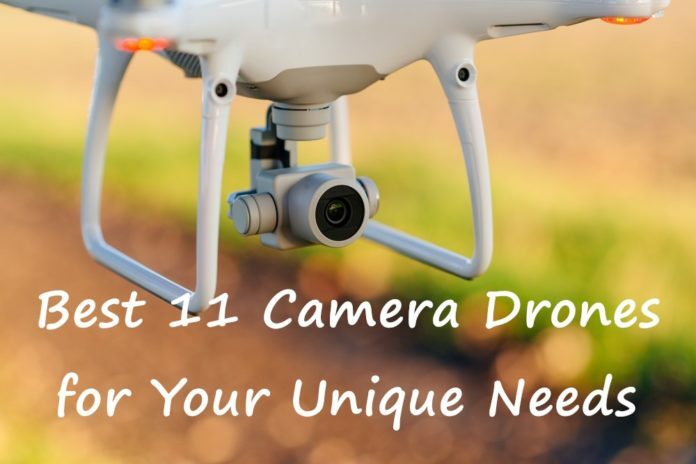 You may be limited by budget, but with even a modest investment you can obtain a camera drone that will allow you to have a lot of fun and perhaps create some stunning images to share with the world. There are options at each at each price and performance point. We are going to make three suggestions based on your budget and level of performance you want to achieve. 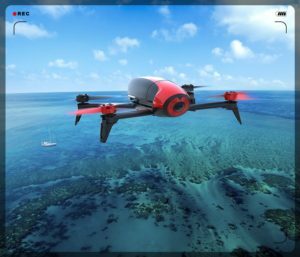 All the drones reviewed are quality flying machines, and in some cases, it is just a matter of personal taste as to which is right for you. An excellent choice for those desiring an introduction to the hobby, without breaking the bank, is the Parrot AR 2.0. 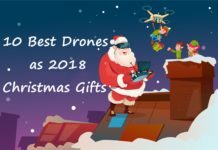 Its combination of a low price, adequate feature set, and new pilot friendliness make it an option you should look at carefully if you are thinking of becoming a camera drone owner. If you already have some drone experience and are looking for a mid-priced upgrade to your current equipment, the DJI Spark needs to be seriously considered. 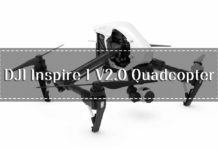 This compact drone is loaded with features that will enable you to continue to grow your skills as a pilot and aerial photographer. Professional photographers or those who aspire to be one, want the maximum performance available. 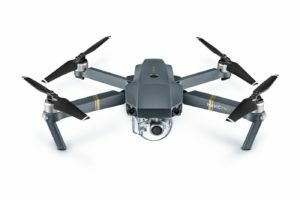 The DJI Inspire 2 should fit the bill. Purchasing one is not a trivial investment, but the potential rewards will make it well worth your money. 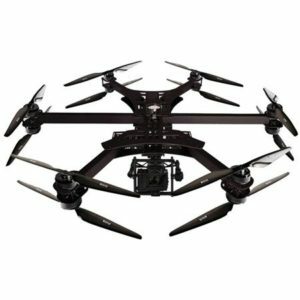 The combination of drone and camera performance make this an excellent drone for your serious aerial photography needs. the easiest thing to remember of. I say to you, I definitely get irked whilst other people consider worries that they plainly do not realize about. You could certainly see your skills in the work you write. The arena hopes for even more passionate writers such as you who aren’t afraid to mention how they believe.